ShiftKarado, India’s leading packing and moving company, has recently released its enhanced Mobile Application on Google Play Store. Offering a wide range of Packing Services, Shifting Services, Storage Services, Express Moving Services. ShiftKarado is now reaching hundreds of mobile users after rolling out the updated version of ShiftKarado Mobile App. Those who are looking for a simple and convenient way to shift to their new workplace or new house can sign up on the app and plan their move. After several months of dedication and hard-work, the app is redesigned and developed to enhance the user experience while booking relocation services, processing the payment, etc in the safest and secure form. 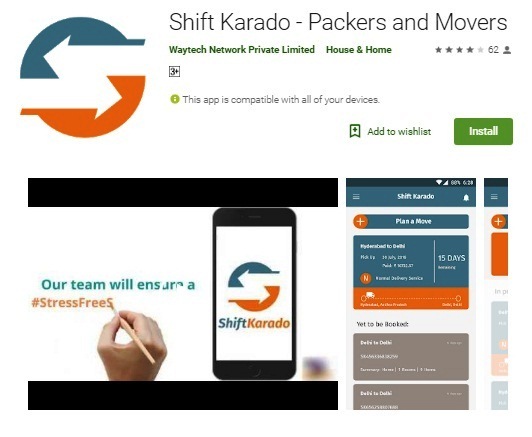 ShiftKarado app leaves behind the traditional way of booking the moving and packing services, waiting for the quote, and manually contacting the in-charge person for getting updates. All the services of ShiftKarado are operational 24x7 on the app, which means users can book for relocation services and pay the amount instantly. It allows the users to get a precise and instant pricing quote upon sharing the required details such as address, day, items to ship, time, etc. while planning their move. Login to the app is OTP based, therefore users’ data and information on the app is time-stamped and secured. ShiftKarado app not does not only saves the users a lot of time for quotation but also hands them the convenience to customize their budget and pricing accordingly. ShiftKarado exclusively offers Packing Services, Household Shifting Services, Unpacking Services, Storage Services, Express Moving Services, which can be availed through the website as well as the Mobile App. The ShiftKarado has achieved a 4.1/5 rating on Google Play Store.